Marigold’s family think she’s quite special – and funny, too. This cat, whom the family adopted from 4 Paws With a Cause in Medford, NJ, after seeing her photo on Petfinder, has a curl in her tail that would make a Spitz dog proud. Not only does she have the curl, but from time to time, she seems improbably surprised to find it perched there on her rear end and gives it a swift chase. Marigold positions herself to play. “We think she doesn’t know she has a tail … or maybe she just brings along a toy wherever she goes,” says her adopter, Sarah Trust of Moorestown, NJ. We have our smartphones; Marigold has her tail — nice things to have with you to keep from getting bored. 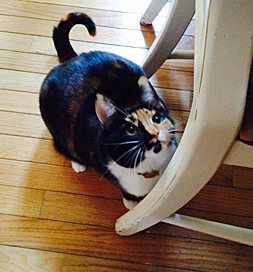 A cat around the house is a great companion – and Marigold is as merry as they come.